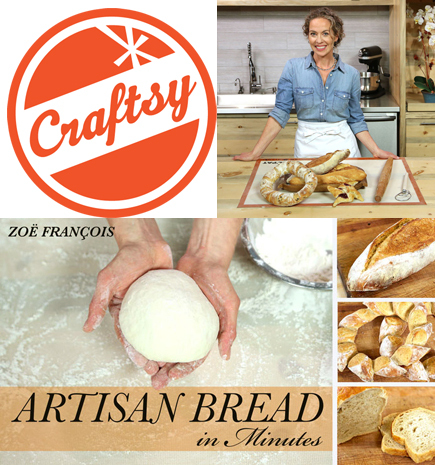 As a big THANK YOU to our Breadin5 community, we’re giving away our Craftsy Artisan Bread in Minutes class to a random winner. All you have to do is click on the link below to enter. Good luck and enjoy the class. I’m already registered for the class, so don’t choose me, but I wanted to comment to tell you how much I’ve enjoyed it. I’m not done watching it all, but it’s been great to watch Zoe teach. Terrific, thanks Karen, thanks Samina, come back anytime with questions. But also wanted to say it’s a great class. Sign up for it, if you don’t win the free one. Thanks Zoe for showing me new techniques and ideas. I watched your video on slashing the bread top the other day. It was so helpful. I’m making the Master recipe today to have fresh bread this holiday weekend for our guests. I am on a calorie counting diet and I looked all through the “New Artisan Bread in 5 minutes a day” and I couldn’t find any information about the calories or nutritional content of any of the recipes. I am using the “Master Recipe” for bread and pizza. I can make a nice sized pizza from 8 oz. of dough. How many calories from the dough in the pizza? Just started baking with your Gluten Free Artisan Bread book. Jumped straight to the Monkey Bread and it was a huge hit. I am trying the Challah today but want to know the best way to mail GF breads. You say not to store inside foil or plastic. I want to mail a loaf to my niece in Alsaka. What is the best way to do this? I have to be honest– gluten-free breads made without preservatives or chemical dough conditioners (like ours) don’t do so well as they start to get stale. My guess is that it won’t be good if you mail to Alaska. Here’s how I’d test that. Make one for yourself, seal it tightly– yes, in plastic to try to keep it from drying out. Sample it however long it’ll take to get to Alaska. Curious how you make out with this. Thanks so much for your reply. Lol, your suggestion is easier than my idea of just making a loaf and sending it to see what happens. I have wrapped my loaf at home in wax paper – 3 days and still good. I need to check with the post office – I doubt there is 2 day priority from the east coast to Alaska. Wonder how long a package will take. Will let you know what happens. Or even plastic wrap to really seal in the moisture. Once it’s completely, completely cooled. Just about all my bread baking is now done with your method. Everything is so good and I am amazed at the versatility of the different doughs. I look forward to winning the video class and hope to learn more. Thanks for the kind words Jovina! You can make versions of the buns we have in that book, starting on page 90, that would work great as hot dog or hamburger buns– just shape differently– flatter and wider for hamburgers, and flatter and longer for hot dogs. Rarely do I buy bread in a store and I am deeply grateful to you. The only change would be related to liquid content, because maple syrup has a little water–it’s not a pure sugar. You may need a little extra water– maybe 1/4-cup? It’ll take a little experimentation but the result will be great. One warning– sugars are hygroscopic (meaning that they attract and hold onto water). So your maple-free version may seem a little drier. The salt you’re planning to increase is also hygroscopic, so that might make up some of the difference. Hi! I have a question…. Yes, it’s in Healthy Bread in 5 Min/Day, we have a cinnamon-raisin bagel (page 74). If you don’t have access to that book let me know and I’ll search for something. Have you used our Search Bar (above)? Type cinnamon into there. Thanks! I don’t have that book….I did a search and only came up with other cinnamon bread types – not bagels. But, I could have missed it? If you can find it easily, that would rock! If not, I’ll keep searching. Thanks! Hi. I bake your breads all the time, and because I try to avoid plastic, I store the dough in a large glass bowl. I was thinking of switching to stainless steel but I thought I’d read somewhere that it’s not good to use stainless steel bowls for yeast doughs. Do you know if that’s true? I think stainless steel’s just fine, see what you think. I’ve done it, though not usually. Can’t think of any reason why there’d be a problem.